The Kirchstraße - formerly called Kirchgasse or church road - leads up to the 1255 first mentioned church. She was a long time the only road that was built in the "church district" with houses. 1898, when almost all the streets of the town were renamed streets, they also received its present name. Findings on both sides of the Pfinz, today leaves and place on old traffic junction of Staig, show that already in the 6th and 7th centuries AD, Frankish settlers - had settled in these areas - place names after, under a leader Grezzo. Between the two settlements that grew together over time, the Kirchgasse certainly served as a connection. Previously ran the street from the Staig on Pfinz up to the mill on the Nidda place. First, the railway line to Pforzheim divided since its completion in 1861 of Wilderswil in two parts. 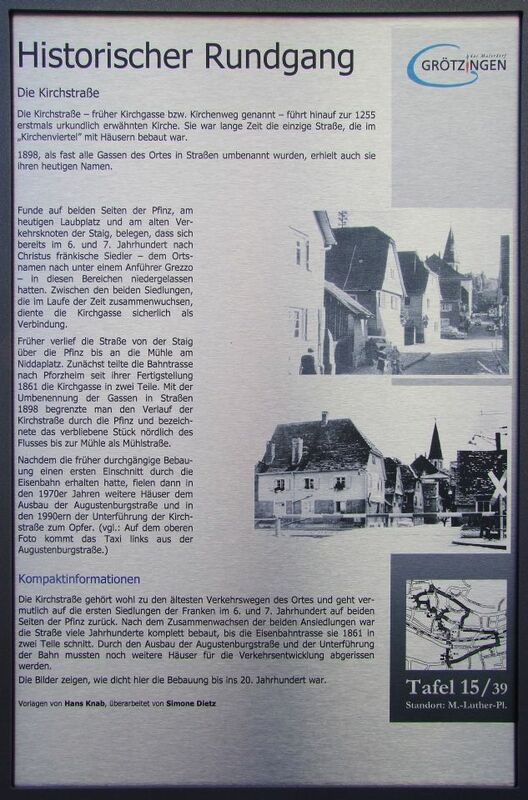 With the renaming of streets in streets in 1898 it limited the progress of the Kirchstraße by the Pfinz and designated the remaining piece north of the river to the mill as Mill Road.